Colonia, Yap – A day after being notified that the Guam men’s volleyball team would not be competing in the playoffs and will be held out of medal contention, Guam volleyball was in dire need of good news. Good news came in the form of a dominant victory for Guam’s ladies in their rematch against Palau in the semifinals Thursday. There was no denying Guam’s ladies they flipped the script on Palau by knocking out the #2 seed in straight sets 25-17, 25-22, 25-17 to advance to the gold medal game on Friday. 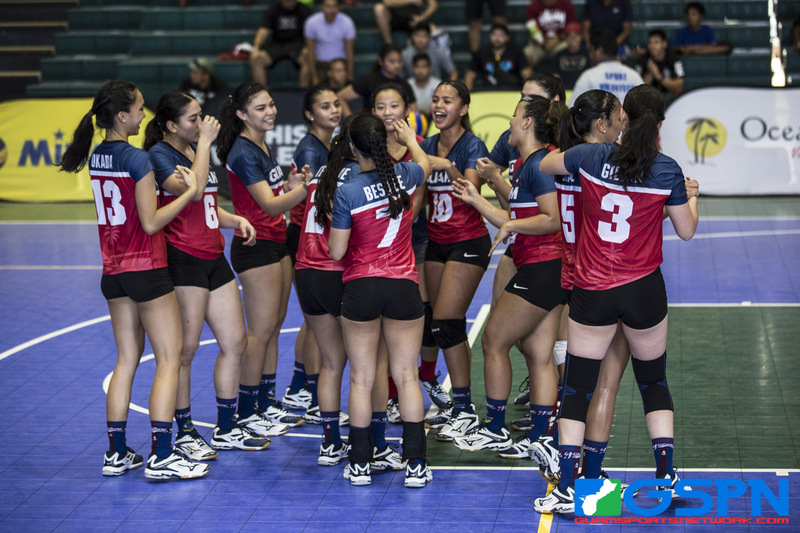 Guam looked as sharp as ever as they took control of the game late in each set and never looked back. Guam’s defense did a great job at minimizing Palau’s Holly Yamada’s output as Yamada broke loose in their previous meeting. “We went in today with a game plan and coach [Mike] told us that we would win if we executed that game plan. And that’s what we did, we stayed sharp and minimized our errors and played to our potential,” said team captain Mary Gillan. Palau took a 13-12 lead in the opening set, but a kill from Guam’s Joie Blas tied the score at 14. Guam would grab a 19-16 lead after a long rally before closing the 1st set on a 6-1 run to stifle Palau. Blas got off to a hot start in the 2nd set after giving Guam a 4-3 lead after a kill and block. Gillan and outside hitter Muneka Taisipic went back-to-back on kills to put Guam up 11-8. Gillan and Yamada would trade shots as Guam was clinging to a 16-15 advantage. Yamada would tie the game at 19 as the Palau crowd started getting lively in their chants. Gillan ended the back-and-forth with a pair of aces to put Guam up 23-20. A final shot from Yamada got Palau within 24-22, but a hitting error put Guam up two sets to none. Guam would close out the 3rd set in dominating fashion as Blas went to work for two more kills that translated to an early 10-4 advantage. Gillan and Lori Okada kept the offense rolling with two more kills to get a 14-6 lead. Middle Hillary Diaz smashed a free ball down the middle to give Guam their largest lead 18-7. A short 4-1 run by Palau got them as close as 23-16 before Gillan sent them packing with a soft shot down the middle for the match point 25-17. With the team full of first-time Micro Games players, Gillan has seen growth from her younger teammates every single game. And Thursday’s showing was a good example of how dangerous the team can be when everyone is on the same page. With one game standing between Guam’s ladies and successfully defending a gold medal, Gillan and the girls are only focused on their side of the court.